Yesterday, September 20th, a coalition of politicians, activists, and artists from across the Puerto Rican diaspora came together in New York City's Union Square to commemorate the one-year anniversary of Hurricane Maria. The hurricane devastated the island; a recent study determined that at least 2,975 Puerto Ricans lost their lives to the storm and its aftereffects, a number 46 times higher than the government's previous estimate (a Harvard study from May put the number at nearly 6,000). President Trump recently disputed the death toll, blaming Democrats for the figure. Despite our President's outrageous mishandling of the disaster, the people of Puerto Rican are fighting for a recovery. 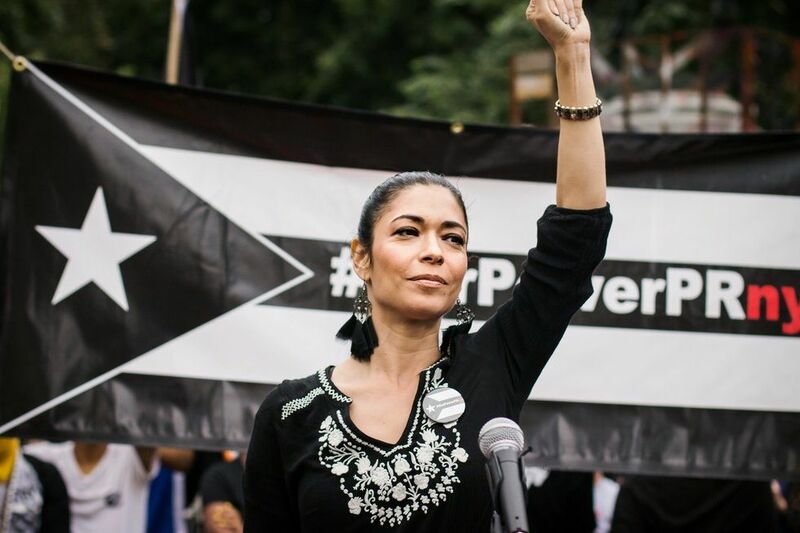 Grassroots initiative #OurPowerPRNYC hosted the commemorative rally yesterday, hoping to, according to a press release, "reflect on the devastating events of the past year, and uplift the many acts of resistance and resilience carried out on the island." The organization has a concrete platform: to address the U.S. government's negligence in its response to the crisis, to demand self-determination and sovereignty for the island (Puerto Rico currently operates as something of a colony to the United States — its residents are U.S. citizens, yet they do not have electoral representation in Congress and cannot vote for president), and to ensure a "just recovery." Last night's speakers and attendees included the likes of New York's progressive firebrand Alexandria Ocasio-Cortez, New York State Senator Gustavo Rivera, New York City Council Member Carlina Rivera, and writer and climate change activist Naomi Klein. There were performances from BombaYo, poet and musician Caridad de la Luz ("La Bruja"), and more. Check out photos by from the event, below. Caridad de la Luz, aka "La Bruja"